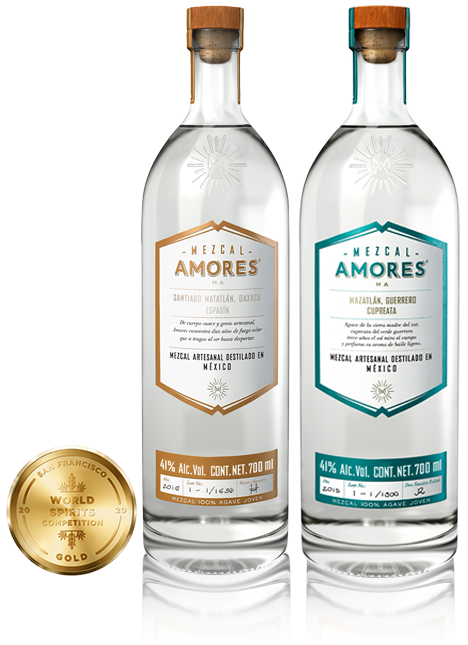 Mezcal Amores is an artisanal spirit, batch-produced using traditional, sustainable techniques. For each Mezcal Amores batch, the team selects the most interesting terroir, the ideal varietal of agave and the most skilled master distiller to work with. However, all Mezcal Amores expressions have a philosophy in common - 100% natural, organic and sustainable processes, including milling with a tahona stone turned by a mule, and natural fermentation in open wooden vats. The brand dedicates 15% of its net profits to ecological and social sustainability programmes. They also replant 10 agaves for every plant they harvest, as well as establishing a nursery to propagate heritage agave varietals and maintain biodiversity. Mezcal Amores - a project made with love. Espadín and Cupreata are two single-varietal mezcals reflecting their terroir - 100% Espadín (Angustifolia) agave from Oaxaca State, grown 7 to 10 years; and 100% Cupreata (Papalote) agave, grown for between 8 to 13 years, from Guerrero State. Each batch of Mezcal Amores is subtly different, reflecting the essence and character of the village where the expression is created, as well as the individuality and experience of the maestro mezcalero. Despite its ultra-modern looks, this eye-catching mezcal is produced with the utmost artisanal care and traditional methods. Mezcal Verde dedicated craft distillery opened in the Oaxacan village of Tlacolula in 2017 and is capable of producing 7,000l of batch-distilled mezcal a year. Mezcal Verde is made from organically grown, 8-year-old Espadín agave. It is cooked using three different types of wood - ocote, red oak and pepper tree - to achieve a complex, balanced flavour profile that makes it work brilliantly in cocktails. After Tahona stone milling, natural fermentation with its own yeast in ayacahuite pine vats and double distillation in maestro mezcalero Doroteo Garcia's small copper still, it is bottled at 42% ABV. Every batch of Mezcal Verde features a unique label designed by a contemporary Mexican artist. It is another collaboration aimed at supporting the local culture of the mezcal-producing regions - be it farmers, distillers or artists. And it captures the essence of any good drink - enjoy the moment and have fun together.